This book looks at both outer and inner realities. It looks at the Chakra System as a profound system for spiritual growth, as well as a diagram of the sacred architecture in which we are embedded—the larger structure that holds us. If we are indeed “fashioned in the image of God,” I believe the sacred architecture found in nature is the blueprint for our internal structures as well, both in the body and the psyche. When the bridge is made between our inner and outer worlds, they become seamlessly one, and inner growth is no longer antithetical to outer work in the world. Therefore this book uses many models that are scientific in nature, as a way of illustrating ancient wisdom with modern metaphors. In addition to extensive chapters on each of the seven chakras and chapters on “How Chakras Interact,” “Chakras and Relationships,” “An Evolutionary Perspective,” and “Fostering Healthy Chakras in Children,” Judith also includes guided meditations, artwork and personal anecdotes to help the chakras come more alive, and to connect readers intuitively to the information. Plus appendices on “Divination and Healing” and “Chakras and Magic,” and a helpful glossary. Also by Anodea Judith are The Sevenfold Journey and Eastern Body, Western Mind: Psychology and the Chakra System. Many people focus on a single chakra - like the Crown Chakra for Spirituality, the Brow Chakra for Psychic Powers, the Heart Chakra for Universal Love, the Solar Plexus for Power (especially for those into the martial arts) and so on - each chakra's special attribute. And some people try to repress the 'lower' chakras as morally bad. BUT the real importance is to understand the chakras as The Energy System of the entire Mind/Body/Spirit Complex. 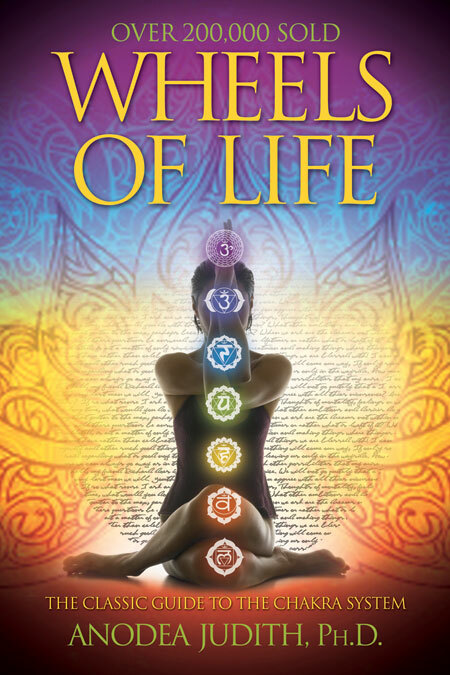 At the inner core of each one of us spin seven wheel-like energy centers called chakras. Swirling intersections of vital life forces, each chakra reflects an aspect of consciousness essential to our lives. Together the seven chakras form a system of modeling that consciousness that enables us to better see ourselves - in mind, body, behavior and culture. This system is a valuable tool for personal and planetary growth.An instruction manual for owning and operating the inner gears that run the machinery of our lives. Written in a practical, down-to-earth style, this fully illustrated book will take the reader on a journey through aspects of consciousness, from the bodily instincts of survival to the processing of deep thoughts. Discover this ancient metaphysical system under the new light of popular Western metaphors: quantum physics, elemental magick, Kabbalah, physical exercises, poetic meditations, and visionary art.